Baseball's regular season is nearly upon us. That means, among other things, that we're nearing the start of a new minor-league season as well. This year, we're expanding our coverage of the minors by launching this weekly feature -- MLB Prospect Watch -- where we'll track top prospects and top performers for every team and provide bite-sized insights into their seasons and profiles. Sometimes, we'll even do themed versions of the list -- like this week, as we highlight a prospect per team who could make an impact at the big-league level this season. When possible, we picked someone other than the obvious top prospect choice. Before we jump in, let's issue a few caveats. Foremost, we aren't scouts. We'll talk to scouts and front-office types to inform our evaluations, but we're not pretending to be gurus here. As such, we're also going to be deferring to other prospect-based publications: they have more eyes, they have more ears, and they do quality work. Finally, and this is the most important point, remember that minor-league players are woefully underpaid for their work and deserve better. Jon Duplantier (ranked No. 87 by FanGraphs) has battled his body since his collegiate days at Rice. Arm trouble limited him to 74 innings last season, so the questions about his durability remain valid. Duplantier has a varied arsenal, including a pair of breaking balls. He also has a long-armed delivery and low release point that creates concern about his command and ability to retire lefties. Provided he stays healthy -- and there's no guarantee -- he should reach the majors before long. The Braves have a plethora of young arms who are nearing or already in the majors. We're giving Kyle Wright the nod due to Mike Soroka's shoulder concerns. Wright has a starter's build and a deep arsenal, including a high-spin fastball and a quality curveball. He should develop into at least a mid-rotation arm. You could slot a number of players in here, including outfielders Yusniel Diaz and Austin Hays, infielder Ryan Mountcastle, and right-hander Dean Kremer. We're going instead with lefty Keegan Akin, who struck out more than a batter per inning last season in 25 Double-A starts. Akin is on the shorter side, but has a physical frame and has the chance for three average or better pitches. Baltimore's rotation figures to be awful, so Akin is likely to reach the majors during the first half. If he improves his command (he doesn't keep his glove in the box) and his consistency, he could become a No. 3 or 4 starter. Yes, Durbin Feltman was drafted last June. Yes, MLB.com and FanGraphs ranked him outside the top 10 in a weak system. And yes, we're still giving him this spot. Dave Dombrowski is willing to rush prospects, and the temptation to plug in Feltman when Boston's bullpen struggles is going to prove too great to resist. He struck out 36 of the 95 batters he faced as a professional last season, and he has a pair of high-quality offerings in his fastball and slider. We're all-in on Feltman becoming a key piece of this year's Red Sox's bullpen. The Cubs system doesn't offer many choices. Adbert Alzolay is a good one though thanks to his power fastball-slider combination. He was limited to eight Triple-A starts last season due to a lat injury, but should be in line for big-league duty in some capacity before the year is out. The jury remains out on whether he'll be a starter for the long haul. Of course we're going with Eloy Jimenez. He's a middle-of-the-order bat who would be in the majors from Opening Day were it not for service time manipulation. Jimenez posted a .961 OPS between Double- and Triple-A last season and should be a legit Rookie of the Year Award candidate. Likewise, Nick Senzel is going to compete for the National League version of the award. The great unknown here is where he'll play. He's historically been a third baseman, but the Reds have tried him at second base and there's a chance he ends up as their primary center fielder. Wherever he lands, he's going to become a high-grade player. We wanted to break up the string of "duh" selections, so let's return to the 2018 draft class for a different right-handed reliever: Nick Sandlin. Cleveland permitted him to reach Double-A last season, and he's a safe bet to hit the majors this year. Sandlin isn't a high-wattage arm, as he relies upon a selection of average-ish pitches, but there's good reason why Baseball Prospectus noted he could be the first '18 draftee to reach the Show. He atones for his arsenal with control and deception -- he's primarily a sidearmer who will alter his release point when he sees fit. It's an interesting profile, and one that should see the light of a Cleveland day before long. There are better prospects to pick from, but we're going with Josh Fuentes for human-interest reasons. You might know him as Nolan Arenado's cousin. His story is more interesting than his bloodlines, however. He joined the Rockies as an undrafted free agent and was added to the 40-man roster only after he hit .300-plus three seasons in a row (albeit in offensive-friendly environments). Fuentes doesn't walk a ton, so he'll need to make consistent hard contact against big-league pitching in order to stick. Look for him to get an opportunity at a bench role before the year is out. The Tigers have a fair number of decent prospects slated to reach the majors before the year is out. Catcher Jake Rogers doesn't have the highest upside of the bunch, but he may have the best chance of turning in a 10-year big-league career. Baseball Prospectus wrote that "you aren't going to find a better defensive catching prospect than Rogers," based on his athleticism, strong arm, and high-grade receiving. As for his bat … well, hey, how about that defense? The Astros have no shortage of compelling youngsters on the brink of the big leagues, including Forrest Whitley, Kyle Tucker, and Josh James. Outfielder Myles Straw can't compete when it comes to pure upside, but he's intriguing in his own right. Straw is a near-elite runner who posted a top-20 Sprint Speed during his cameo per Statcast. He can field and throw, and he reached base more than 38 percent of the time last year in the upper-minors. So, what's the issue? Straw has exhibited almost zero power. FanGraphs noted he had one of the lowest pull percentages in baseball, and he's homered just four times in nearly 2,000 professional trips to the plate. It's not a profile that tends to translate into a lengthy run as a starter, so we understand any and all skepticism about him being the outlier. We'd just like to see Straw get the opportunity before he's relegated to a long career as a fourth or fifth outfielder. There's plenty to nitpick about the Royals' current roster -- just not their double-play combination of Adalberto Mondesi and Whit Merrifield. In theory, that could make it tougher for infielder Nicky Lopez to break into the majors. In practice, he's made a habit of overcoming the odds. As Baseball America wrote last year, Lopez stood just 4-foot-11 as a high-school freshman. He's now (generously) listed at 5-foot-11. His instincts and good eye (he's walked more than he's struck out as a pro) have helped him rise through the ranks quickly, and he should get a shot somewhere on the Royals roster before the season is out. Again, we're trying to avoid just picking top prospects. That's why we're stepping past Griffin Canning (a good pick for seeing time in the Angels rotation) in favor of Jared Walsh, a potential two-way player. Walsh was originally a 39th-round pick who broke onto the scene last season by posting an .895 OPS across three levels. He's shown some aptitude for pitching, too, and if any team knows the value of having someone who can pitch and hit, it's the Angels. Tony Gonsolin is a little older and more experienced than the better-known Dustin May, so we're betting he's more likely to get the call at some point this year. Gonsolin's Bronson Arroyo-like leg kick and '70s aesthetic suggests what he desires most is to get lost in your rock and roll. He has a deep arsenal and a starter's frame. So long as he stays healthy and throws strikes, he should eventually take a couple turns in the Dodgers rotation. Worst-case: he'll pop up in relief. It feels like cheating to pick Sandy Alcantara (who is barely prospect eligible) or Victor Victor Mesa. Instead we'll go with Nick Neidert, a piece of the return on Dee Gordon. The odds are working against Neidert, a smallish right-hander who relies upon his changeup and his command to keep batters in check. He's probably not the next Kyle Hendricks, meaning his upside is more likely to be as a No. 4 or 5 starter. On the bright side, he'll be in Miami sooner than later. Mauricio Dubon isn't Milwaukee's best prospect -- likely not even among middle infielders, thanks to Keston Hiura -- but his ability to play a tolerable shortstop gives him the inside track on a big-league job should Orlando Arcia struggle again. Whereas Arcia's value is in his glove, Dubon's is in his stick. He has above-average bat-to-ball skills and solid wheels. It's not a star profile, but he could play a more important role in Milwaukee's season than expected. It's been a long time coming for Lewis Thorpe, who originally signed with the Twins in 2012. He's since missed time due to elbow woes and mono. He reached Triple-A last season, however, and should slide onto the Twins' pitching staff before the year ends. Thorpe isn't likely to develop into the front-end starter scouts thought he could when he was younger. He could provide league-average or better pitching though, and that will be handy if Minnesota is in the playoff hunt. Pete Alonso can hit. He should probably break camp with the Mets. He likely won't due to service-time tricks. That about sums it up. A great find on the Yankees' part, Jonathan Loaisiga reached the majors last season but was tormented by shoulder woes. It wouldn't be surprising if Loaisiga ends up in the bullpen down the road due to his lack of size and near-constant durability concerns. He has big-time stuff, so expect the Yankees to give him every chance to make it as a starter before converting him. Sean Murphy is a potentially interesting backstop with good defense and more offensive potential than, say, Jake Rogers. But we have to give it to Jesus Luzardo. He could break camp with the A's behind his quality arsenal and feel for pitching. With any luck, he'll develop into a No. 2 starter type. The Phillies have a number of rotation fill-in candidates to pick from. We drew Ranger Suarez's name from a cap and that's that. OK -- we didn't and that's not that. 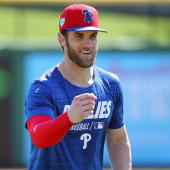 We do think it's possible the Phillies shift him to a relief role and that his left-handedness comes in handy later in the season though. Mitch Keller is the better overall prospect, but we wanted to give third baseman Ke'Bryan Hayes some love. He's coming off a big season in Double-A and profiles as an above-average defender with a good hit tool and the chance to add more power. He won't turn 23 until next year and the Pirates are likely to game his clock, but he could usurp Jung Ho Kang sooner than later. ESPN's Keith Law was among those to rank Fernando Tatis Jr. as the best prospect in baseball and we can't disagree. He's a legitimate shortstop with middle-of-the-order potential. That's fun, and it should be a blast to see him next to Manny Machado for the foreseeable future. We just hope the Padres don't play service-time games with him. It feels like Ray Black has been around forever. He finally made his big-league debut last season, posting a 6.17 ERA in 23 innings. Black still showed off a fastball that has long enamored scouts: A 98-mph pitch with a high spin rate that caused batters to whiff on more than a third of their swings taken against it. He'll probably never have enough command to make the most of it, but we're putting him down here because he should get ample opportunity for the transitioning Giants. The Mariners undoubtedly have better prospects than Braden Bishop on their farm -- starters Justus Sheffield and Justin Dunn included -- but there's a clear path for Bishop to get a real opportunity in the outfield. As it stands, Mallex Smith is injured; Ichiro Suzuki is likely around just for the opening series in Japan; and Jay Bruce is prone to missing time. Domingo Santana, for his part, isn't much of a fielder and could be phased out quickly if his bat doesn't recover. Bishop -- who will be in Japan as well -- is the only other outfielder on the 40-man and his speed-and-defense would be welcomed in center. Ultimately, his hit tool will determine if he sticks as more than a reserve. Add in that he seems like a quality human being, and we'll be rooting for him to get a look. At one point Alex Reyes was in the discussion for the best prospect in baseball. He's still trying to overcome injuries and get his career on track after missing all of 2017 and most of 2018. He'll start the season in the bullpen and could work his way into the rotation. So long as he stays hearty and hale, he's likely to provide an impact. You can argue Brent Honeywell or Nathaniel Lowe deserve this spot. We're giving it to Brandon Lowe, a well-rounded second baseman who started his big-league career on an 0-for-19 stretch. Lowe, who signed a six-year contract with Tampa Bay this week, recovered and could well take over the keystone for Tampa Bay before 2019 ends. At minimum, he should serve as a quality safety net. Taylor Hearn has been traded at the deadline twice in recent seasons -- first as part of the Mark Melancon-to-Washington deal, then again last July when the Pirates landed Keone Kela. Hearn is a tall and long lefty with a big fastball who needs to continue to develop his command and breaking ball. The Rangers owe it to themselves to see if he can make it work as a starter due to upside. Even if they pull the plug on that, he should see some action for Texas in 2019. Vladimir Guerrero Jr. should've been in the majors last spring. Victor Robles is one reason to not count out the Nationals. He's a five-tool talent with the chance to develop into a star. Don't be surprised if he ends up as a better all-around player than Juan Soto.